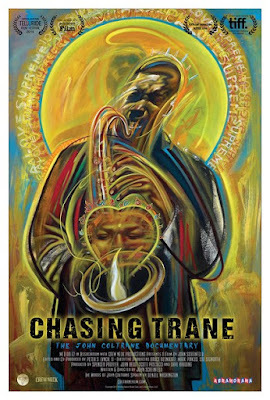 Today I went to the Bloor Hot Docs Cinema in downtown Toronto to see Chasing Trane: The John Coltrane Documentary. This is the first ever documentary about Coltrane. It's long overdue and it's obvious that Coltrane's family led by his sax playing son Ravi Coltrane have wanted to do this for a long time. The film was written and directed by John Scheinfeld who has directed many similar documentaries for PBS. The one I remember is the 2010 film Who Is Harry Nilsson (And Why Is Everyone Talkin' About Him?). I watched that on PBS. This is Scheinfeld's first attempt at chronicling a jazz artist. The biggest hurdle in trying to do a documentary about Coltrane is though there is plenty of performance video footage, he never did any video or audio interviews. He did print interviews with Down Beat Magazine for example and he also wrote liner notes for his albums. Obviously that's not very cinematic. So Scheinfeld asked Denzel Washington to read Coltrane's words for the film. Washington doesn't try to be Coltrane. He reads the words in his own voice. And there's not a lot of that so it's not really narration. I think Washington's participation helped promote the film. But I don't think it was necessary. And that's my only criticism of the film. 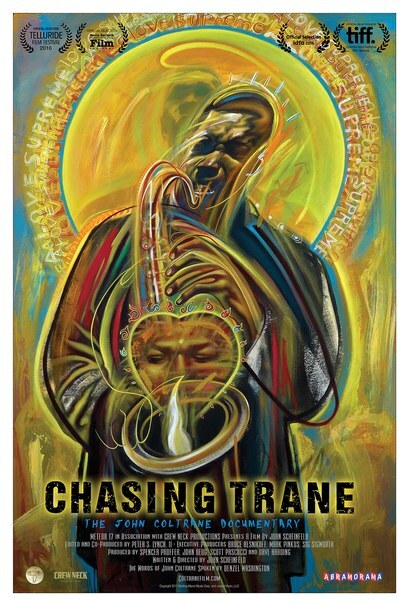 Other than that, Chasing Trane is a straightforward chronicle of John Coltrane's life and career. Even if you're a big Coltrane fan and you're familiar with his story, you need to see this film because it hasn't been done before. And this needed to be done because Coltrane is one of the most influential figures in modern music history. There are plenty of interviews with Coltrane's musician pals like Benny Golson, Wayne Shorter, Sonny Rollins, McCoy Tyner and Jimmy Heath along with guys who he influenced like rapper Common, Bill Clinton (he plays sax), Carlos Santana and The Doors drummer John Densmore who are huge jazz fans, Wynton Marsalis, Kamasi Washington and of course Coltrane's son Ravi and other family members. We also see a lot of professor Cornel West who appears in a lot of black history documentaries. The film covers Coltrane's history comprehensively including things like his 50s heroin addiction. It also covers Coltrane's important music like A Love Supreme. And it talks about his family life. The most important thing is it chronicles how Coltrane's music changed over the years especially when in 1965 he changed to a free jazz style that was less accessible than his Classic Quartet. This film is a must for jazz fans. Check out the trailer.